Well, at least someone is actively pursuing a biblically sound approach to money, currency, and economics at some level. And who is this maverick rising up against the fiat-currency fueled fiat-slavery system of Monopoly Money that now, for a season, dominates the globe? Who is it that has risen to shake off the shackles of control purposefully created by and for an elite money-printing class so that they might own everyone and everything beneath them through the power of the fiat currencies that they craft effortlessly out of thin air? Is it “Christian nation” America? Is it England, France, or maybe Germany, with their rich Christian traditions? Maybe the modern nation state of Israel? 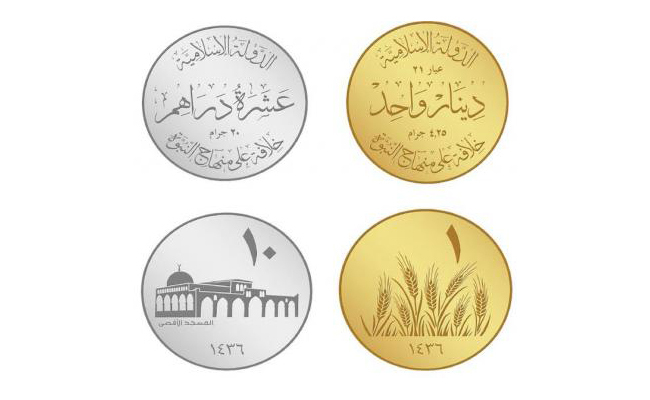 The Islamic State is the one state actively pursuing something of a biblical approach to currency, money, and economics in these “last days”, while the abomination of Monopoly Money fueled slavery is embraced and propped up by any and all means necessary throughout the West, particularly here in “the land of the free” and the home of the NSA. So, in which God (or god) do we trust, exactly? Who is the “god” referenced on the abomination that is the US dollar? And why should we be concerned that the one true God seems to be raising up and empowering an enemy in a manner that is now on the verge of including a real economic foundation to use against the fictional, unbiblical version employed by America? May God grace His people with eyes to see, ears to hear, and the opportunity to prepare for the storm that is gathering – the storm that a proud and rebellious America has brought upon herself. May the Lord equip and move His people to seize every present and future opportunity to proclaim and apply His Gospel-fueled Great Commission in every realm of His creation, so that someday soon our culture might embrace biblical standards for all things, including currency.